We drink alkaline ionized water for the healthy properties. The electrodes create the water electrolysis /ionization which deliver those benefits. When it comes to water ionizers, understanding electrodes in the water cell is like understanding the importance of your cardiac system to your overall health. The water cell is the heart of a water ionizer. It consists of a series of electrodes (plates), each separated by a membrane. This page will explain how water ionizers electrode technologies differ and what that means to water ionizer performance and ultimately your health. There is so much hype and misinformation about water ionizer electrodes or plates. Some say bigger plates are better. Others make you think that more plates are better. Some advertise more power applied on electrodes– like 800 watts – as if we were powering 20-inch sub-woofers. We are ionizing water. The reality is that bigger or more plates or more power means inefficient engineering and lower quality materials and manufacturing. More or bigger DOES NOT mean better water ionization performance. An often overlooked yet incredibly important point is that more power also means more heat, which means the platinum plating breaks down faster on the surface of the water ionizer electrode. This equals poor water ionization performance over time. There is hype too around water ionizers electrode/plate type. water ionization performance is not about the electrode/ plate type, but rather the sophistication of the engineering and the quality of the materials and manufacturing. Educate yourself on some basics and you will easily see why our Smart Electrodes offer you the most advanced engineering, along with the best materials and manufacturing. This means more efficient water ionization performance and lasting durability for electrodes/water cell/water ionizer. That is powerful. That is smart. All things that smart shoppers look for. When you discover more about water ionizer Electrodes, you can easily understand what puts Smart Electrodes in a league of their own. Titanium is the base material in every water ionizer electrode/plate, because it has proven safe and effective. It is corrosion resistant, has the highest strength-to-weight ratio of any metal, is very durable, and demonstrates the ability to easily change polarity, which is critically important in the water ionization process. The best water ionizer plates are coated with platinum because it was determined in a 1992 study by the Japanese Ministry of Health, Labor and Welfare, that platinum is the only entirely safe material to use in water ionizer plating/coating. Flat Plate/electrode: The most common, basic and simple plate design. Mesh Plate/electrode: The most technically advanced configuration; also the most expensive to manufacture. Slotted or “Hybrid” Plate/electrode: A less expensive and less effective version of mesh plate technology. Regardless of what you read, the most critical part of an water ionizer electrode is not the type but rather how the electrodes are engineered, what materials are used and how they are applied or manufactured. There are three, distinctly different, types of electrodes / plate designs offered in the market today and each has its own advantages or disadvantages. These are solid plates, slotted or “hybrid” electrodes / plates and mesh electrodes / plates. These differences have a dramatic effect on power delivery inside of the cell. All three types of plates can deliver the electrical current to the water, but why are AlkaViva electrodes / plates the most efficient? Easy … our highly advanced Smart Electrode Technology! A low quality flat plate has no way to organize or channel the current being delivered, meaning it has an inconsistent saturation of electrons. They move across the electrodes / plate finding the path of least resistance, often channeling together and are not effectively or evenly dispersed. This is like watering a garden and having the water run to the low spots and pool there. This results in an inconsistent delivery of power and less efficient / effective water ionization results. In contrast to a flat electrodes /plate, with slotted electrodes, there is a clear path for the electrons to travel in more predictable directions – effectively distributing the power in a consistent pattern. When we till our garden into rows and irrigate we are channeling the water to be delivered to the roots where it is needed most. The slotted electrodes /plate is more effective than the traditional flat electrode/ plate. Often has a less effective surface area, depending on the size of the slot. A mesh electrode /plate uses the same principle as the slotted plate, but improves upon it by providing cross-channeling to more evenly direct electron flow. The applied current more evenly saturates the plate, increasing the effective delivery of electrical current to create better alteration /ionization in your water. Can have a less effective surface area depending on the design of the mesh electrodes . Complete and uniform coverage. Our coating process surpasses all other processes in the water ionization industry to more completely and evenly cover the titanium plates with pure platinum, including all edges and all surfaces. More efficient use of power. This means we can apply less power more efficiently which creates far less heat and stress on the water ionizer electrode/plate during the electrical load phases. View a certified analytical test result from the United States Environmental Protection Agency Primacy Laboratory for the State of Nevada showing that there is no plate leaching. 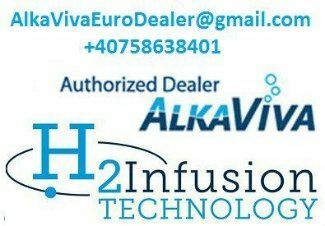 AlkaViva employs proprietary technologies which are able to achieve optimal water ionization-alkalizing and acidifying results without the use of (potentially harmful) solutions such as salt enhancers. All water ionizers employ ion-selective membranes to separate the electrodes and enable the water to “ionically separate” the water into an alkaline and acidic stream. The membrane is absolutely critical in how a waterionizer performs. You can have a well-designed electrode/plate, powered optimally but if you have poor membranes, then you have poor water ionization performance. AlkaViva’s Infusion Membranes are made in-house and are ultrasonically pressed, rather than chemically bonded. This provides you with a distinctly superior electrode membrane, designed to work specifically with our Smart Electrodes, giving you unmatched water ionization performance-pH, -ORP, H2. usage of more watts and amps , spreading the same input voltage over a larger surface area results in less efficiency. This does not deliver the power evenly or efficiently and must do so with greater resistance. More power means more heat, which means the platinum plating breaks down faster on the surface of the water ionizer electrode. This equals poor water ionization performance over time. So now you can see that in truth, bigger electrode is not better. This is why the electronics industry (and others) has shown that when technology advances, it typically results in smaller, more powerful and devices. Why would water ionizers be any different? The truth is they are not.